Ask database developers and administrators about schema comparison tools and chances are one of the first products they mention will be SQL Compare, a comprehensive application that lets you compare live databases as well as database snapshots, backups and creation scripts in source control or in a folder. SQL Compare even supports Windows Azure SQL Database (formerly SQL Azure) and SQL Server on Amazon RDS. Integrated with SSMS, SQL Compare lets you compare and synchronize databases from within the SSMS interface. The product also lets you build custom rules so you can selectively filter what you compare and synchronize. In addition, you can export your comparisons to Excel or HTML, as well as easily generate deployment and rollback scripts. You can even create schema snapshots for auditing and rollback. 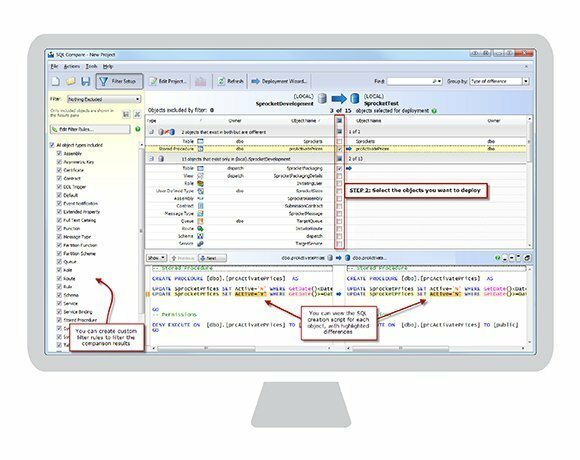 SQL Compare offers the Standard edition (starting at $495) and the Professional edition (starting at $745). With the Professional edition, you can deploy your databases from source control, perform comparisons and synchronization on backups and script files, and deploy a live database from scripts. The Professional edition also lets you automatically script a database into individual object-creation files and includes a command-line utility for automating processes that are part of a continuous integration strategy.